You can transform your interior to a “like-new” look easily, and affordably, with no experience required. Can be done at home by following the simple instructions. No costly professional installation is required. Avoid drastic depreciation by protecting your car’s original fabric and flooring from tears, rips, stains, and gashes. 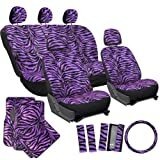 Maintain your car’s initial Interior appearance, as well as, add style and durability to your car seats and flooring with this car seat cover and floor mat set. A complete transformation of your car’s interior from the rear seats to the steering wheel. Protect the original flooring of your car from the daily grind and other occurrences such as excessive dirt, sand, mud, or “accidents” from children, family or friends. Maintain your carpets clean longer with the addition of OxGord floor mats to your vehicle. Maintenance is a breeze with OxGord Car Seat Covers and Floor Mats. The front mats measure 17.25 inches wide and 26.5 inches long. The rear mats measure 17.25 inches wide and 13 inches long. Both fit most models of Cars, Trucks, SUVs, and Vans. Steering wheel cover fits all standard models. Our seat cover and floor mat sets are good for all weather, and keeps your vehicle clean from all spills, dirt, debris, etc. Our Seat Covers and Floor Mats are built from strong and durable materials. Floor mats have non-skid backing to prevent sliding. Effortless Installation (No tools required). Made by OxGord. These covers utilize zippers for 60/40 split benches, detachable pieces for customization, clips for tight fitting in the front or back, buckles to quickly snap on each seat cover, and high quality materials for stain and water resistance fabric. Why wait for the next party when you can take the party with you? Nothing says cool and comfortable like OxGord’s quality velour seat covers.